The Palestinian Authority (PA) will increase financial rewards to the families of terrorists, the PA’s “moderate” prime minister said. 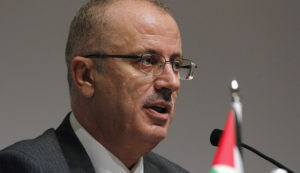 Speaking on June 17 in Ramallah at an iftar meal to break the Ramadan fast, Prime Minister Rami Hamdallah said the “PA and its institutions would continue to provide benefits to the families of terrorists who carry out attacks in Israel,” and would even “work to increase its support for them,” according to a report by Israel National News. Hamdallah, considered by many in the West as a moderate, lauded “all the martyrs who sacrificed their lives for the struggle,” and praised as “heroes” terrorists imprisoned in Israeli jails for attacks, including deadly attacks on innocent civilians. The PA provides monthly salaries to terrorists serving time in Israeli prisons and calculates the pay based on the length of their sentence and seriousness of their offense. The PA routinely uses aid money from foreign nations to pay off the terrorists, a habit that has recently come under increased scrutiny in Europe, particularly the UK.